Secret Superstar’s trailer may give a feeling of a coming of age film, but it is not one for sure. It is much more than that. Directed by debutant Advait Chandan, it traces the story of a small town Indian girl who wants to follow her dream. Insia Malik (Zaira Wasim) is a character who is not easy to like, she is strong headed, focused and knows what she wants. Yet Advait makes us root for her. As an audience, you like her rebellious nature. There is a scene where her tuition teacher asks her to sit, and she sits quietly on the top of the table. That scene made me laugh and root for her at the same time. This is a relief from our Indian movies where our children are supposed to be cute and adorable and not rebel. Advait successfully captures the angst of a teenager, their aspiration to dream and not be bounded by societal pressure. The other aspect of Secret Superstar which it takes upon head on and showcases beautifully is the reality of domestic violence, and how it affects most of us and yet we keep quiet. It is strange that in a nation of a billion people we have a problem with teens holding hands but a husband can beat his wife in public or at home, and no one will interfere saying it is a domestic matter. Advait brilliantly showcases one scene where the husband discovers his wife has sold her jewellery to buy a laptop for their daughter, the scene starts with him asking her to search for a necklace, and we see Insia and her little brother in a room. The camera for a moment focuses on Insia and we see her trembling with fear, this is where we look at the vulnerable side of her for the first time. It also hammers us with the reality that domestic violence can affect not only the victim but children too. It is a stark reminder of our need to speak out against domestic violence. One of the exciting aspects of the film is where the victim is not somebody who is shown as one to be rescued. There is no saviour for Insia or her Ammi. The film highlights the importance how we tend to force victims or dictate our terms. What we need to do is sometimes listen to the victim, and support them and not ask them to chart their life with our moral attitude. Secret Superstar comes to the fore in the second half, when Advait focuses on the Ammi (Meher Vij). It treads into a zone where no Bollywood film has gone so far, showcasing divorce as a solution and that women can be happy without their husbands. 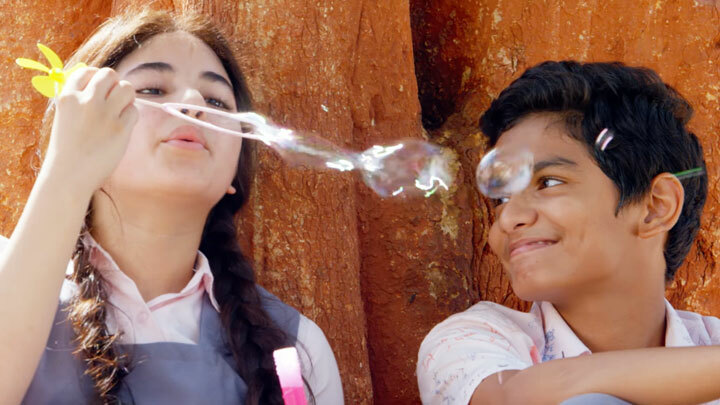 When it comes to teenage romance, Indian films generally tend to go overboard with love with no sensitivity or maturity to handle such delicate romance. Advait’s writing here should get full marks. Then romance between Insia and Chintan (Tirth Sharma) is shown so delicately. I think be it any age when we fall in love all we are looking for is a companion and someone who understands us, all the other jazz does not matter. My biggest grouse with the movie was the music.Considering it plays an essential role in the film, the music is a letdown. I know it is terrible to compare films, but somehow I was comparing this with a debut of Aamir Khan’s directorial which had a great musical score and a better screenplay which milked the melodrama. Advait underplays the melodrama for the most part of the film, there is nothing wrong in that, while Aamir the director used it to his advantage in Taare Zameen Par. I enjoyed Aamir’s character in the film, it could have been a caricature, but Aamir saves the day and makes it fun to watch him perform. Raj Arjun as Insia’s father is a delight to watch, every time he comes onscreen I had goosebumps and was hoping that he would disappear.The film belongs to Meher Vij and Zaira Wasim, and they steal the show. 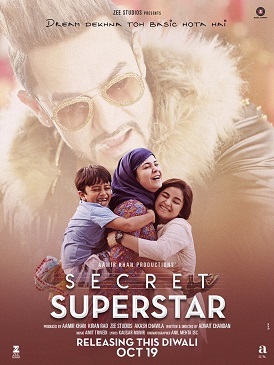 Secret Superstar is a film which has its flaws (duration, the music and uneven first half and subplots) and this is what makes the film good and not great. But it is a film which should be watched and discussed. It is a far more bold movie than Dangal or Taare Zameen Par, and it will hopefully be added to discussions in our drawing rooms this Diwali. In its own way the film tries to break the glass ceiling of Bollywood, and probably, it might not be the last to do so. THE DIRTY PICTURE Review : Silk Appeal! Why Talaash Should Be Renamed "Chudail Ka Badla"?